There’s never a good time to experience tooth injuries, but you may panic when it happens on a Sunday afternoon or the middle of the night. Although O.C. Dental Specialists is not open at this time, please call us at 949-408-0372. Our answering service will page the dentist on call and you will receive a call back promptly. If the dentist decides that you need immediate treatment, he or she will meet you at our Irvine, California office. Cracked and fractured teeth can happen for a variety of reasons. Perhaps you got hit in the mouth with a ball, were involved in a car accident, or simply bit down too hard on the food you were chewing. It can be especially painful when the enamel of your tooth cracks at the same time. The longer you go without treatment, the wider and more painful the crack becomes. One of the most obvious indications that you have cracked a tooth is experiencing pain when you eat or drink something hot or cold. Infections are another common dental emergency because they can cause severe pain. When the pulp of a tooth and the gums surrounding it become inflamed, it could indicate that you need root canal treatment. Our dentists stop the spread of infection by removing the diseased pulp and cleaning your tooth from the inside. At the conclusion of the root canal, your dentist will place a cap on the tooth to prevent additional infections in the future. 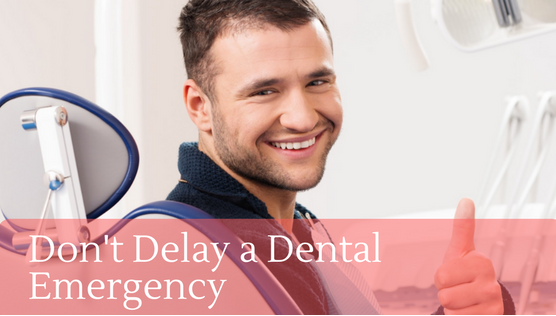 Having your tooth partially or completely knocked out is an obvious dental emergency. Our dentists may be able to save your natural tooth if you act quickly enough. If possible, pick the pieces of the tooth up by the crown and rinse them quickly under warm water. The crown is the top portion of the tooth. Once you have done this, contact us immediately for further instructions. These are just three examples of common dental emergencies. Please don’t hesitate to contact us if you need immediate help.